Molded orthotic foot bed cradles and supports your entire foot. 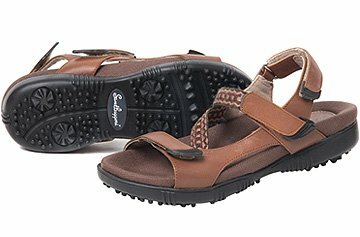 Leather, TR grip soles, molded foot bed, steel shank, built in orthotics, 3 velcro straps. Whole sizes only. Whole sizes accommodate half sizes. If you have any questions about this product by Sandbaggers, contact us by completing and submitting the form below. If you are looking for a specif part number, please include it with your message.